There has never been an inventor or theorist as gifted as Nikola Tesla. There is not even a close second. Einstein and Newton, da Vinci and Darwin, Edison and Hawking all pale in comparison. The self-proclaimed “Masters of the Universe” at the turn of the twentieth century knew Nikola Tesla to be a totally loose cannon. He was an extraordinarily free spirit both spiritually and scientifically. More significantly, Tesla was able to tap into the secrets of the Universe in ways that scared the daylights out of them. In fact he was given the keys to the Universe, and for very good reason. In view of the slowly emerging New World Order (NWO) during the early 19th century a scientific genius like Tesla represented everything TPTB abhorred. All of the NWO globalists at the time sought to further enslave humankind not liberate it. Hence, the very thought of free energy was anathema to them. Whereas Nikola Tesla strove to bring free energy to every resident of Planet Earth, the corrupt, crony, corporate capitalists sought the exact opposite. While Tesla wanted to empower the people, TPTB intended to disempower the populace the world over. Truly, Nikola Tesla was the single most dangerous man the New World Order cabal had ever seen or encountered. There was nothing more destructive to their misguided scheme of total human enslavement than the concept and practical application of genuinely free energy. And, therefore, his intention to provide free energy to every human being had to be stopped. Each of these flawed energy paradigms has had the realized potential to create inconceivable amounts of wealth (and power) for the capitalists who developed them. They would not be deterred in the making of their trillions upon trillions of dollars (especially petrodollars). Nor would they be thwarted in the establishment of their Global Control Matrix (particularly the existing Global Economic & Financial System). Both of these undertakings were critical to the advancement of the NWO agenda. Therefore, Nikola Tesla had to be completely controlled before the free energy genie was let out of the bottle. And so he was … … … for the time being. However, this epic story is not over yet. Not by a long shot! Nikola Tesla is still alive and well … very well as a matter of fact. Both he and his paradigm-shattering theories and ideas, inventions and innovations are being disseminated throughout the Internet at hyper-warp speed. It’s quite true—Tesla is now riding the wild and wondrous waves of the World Wide Web — an earth-shaking marvel of his very own creation. Nothing has served to emancipate humanity the way that the Internet has. Yes, it has also incarcerated those who misuse and abuse its power, but the masses have been set free as no other generation in the past 6000 years. How did Tesla do it? With light. Not plain ordinary light, but with the sacred power-packed light which permeates the Electric Universe. Every sage and seer, saint and siddha down through the ages knew that light from the divine source is permeated with the most rarefied and sublime form of spiritual energy. This is precisely why it’s very important to allow the eyes and the spine to be exposed to the sunlight. The spinal column is literally hardwired to receive the influx of this spiritual energy which then interpenetrates the subtle column of light that exists in every human being. Without this ethereal column of light supporting every person on the planet, the human race would cease to exist. Now Tesla was a true Western spiritualist, just as he was a fervent Eastern mystic. He kept the company of some the greatest saints of his day including the incomparable Swami Vivekananda. Of all the modern saints to populate the subcontinent of India, Swamiji was well known to be the most intellectual of his religious order and utterly brilliant. He was brilliant in so many ways and a genius on the same level as Nikola Tesla, only greater … much greater. For it was Vivekananda whose life’s mission was the dissemination of the most brilliant light of the Cosmos. Were it not for Vivekananda, there would not have been a Tesla. Nikola Tesla assumed an incarnation at a pivotal point during the burgeoning Industrial Revolution in a valiant attempt to establish a clean source of “free energy” as the status quo. Having been prominently configured in the pre-fall days of Atlantis, bequeathing such advanced and enlightened technology was his karmic compensation to the Universe and his fellow man. As the “Chief Scientific Officer” of Atlantis, Tesla would have been well aware of the pervasive misuse of the predominant crystalline-based energy paradigm just as he would have been aware of the grotesque abuse of highly advanced technologies within the arena of genetic engineering/manipulation (e.g. today’s chimera representations by and large come from Atlantean experiments gone awry). Furthermore, just as the distinct possibility exists today for a manmade ELE due to the unrestrained use of nuclear and other forms of technologically advanced weaponry (e.g. DARPA-driven HAARP, Geo-engineering/Chemtrails, Electro-magnetic Pulse (EMP) weapons, Tesla Scalar Interferometers, High Energy Laser-Directed Energy weapons (aka Particle Beam weapons), Space-based weaponry, Tectonic weapons, Weather warfare, Sonic and Ultrasonic weapons—land and sea-based), it was the misapplication of extremely powerful technologies within the realm of advanced weaponry and mind-control mechanisms which sealed Atlantis’ fate. The crucial point of this story is that Tesla was a key personage of the scientific establishment of Atlantis. Hence, he bore much of the responsibility for what went awry in the end times prior to Atlantis sinking into the Atlantic Ocean. Being reborn as he was into the New Atlantis, his destiny was to make recompense for past mistakes by setting the modern civilization on the path toward free energy. In this way energy sources and technologies could not be abused as they have been relentlessly for the past century. 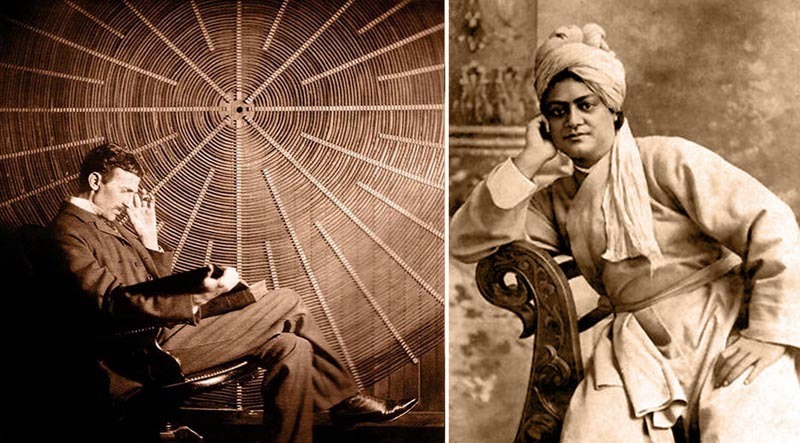 Therefore, it behooves every living soul to ascertain, and acquire, what it was that Nikola Tesla received from Swami Vivekananda. Only in this way will free energy finally emerge in a manner that it will be properly respected and deeply revered for the divine gift that it truly is. For free energy is nothing other than a very special and subtle form of light … divine LIGHT from the original source of all Light. As for the light that Tesla has been disseminating since the very day he died, what follows are some of his greatest contributions to current race of humanity. It’s only a matter of time before Nikola Tesla’s dreams are fulfilled. The profusion of LIGHT now pervading our region of the Milky Way Galaxy is unprecedented during the present era. Now you know why they have implemented a global chemical goengineering program in the form of chemtrails. It’s experienced as an immense cloud cover in order to shut out the light; however, it’s the cosmic rays that they cannot prevent from suffusing the entire Solar System. Not now; not ever! Nikola Tesla was one of the most brilliant inventors of history and was of an unusual intellectual vision. He is affectionately refered to as the “Father of Free Energy“. 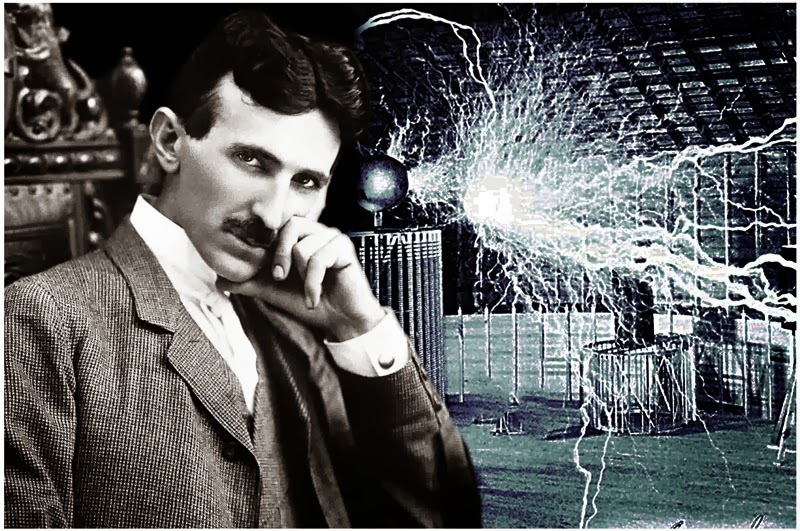 Tesla was a world-renowned Serbian-American inventor, physicist, mechanical engineer and electrical engineer, born in Smiljan, Austrian Empire (present day Croatia). Tesla is regarded as one of the most important inventors in history. He is also well known for his contributions to the discipline of electricity and magnetism in the late 19th and early 20th century. His patents and theoretical work form the basis of modern alternating current electric power (AC) systems, including the polyphase power distribution systems and the AC motor, with which he helped usher in the Second Industrial Revolution. In the United States, Tesla’s fame rivaled that of any other inventor or scientist in history or popular culture. After his demonstration of wirelesscommunication in 1893 and after being the victor in the “War of Currents”, he was widely respected as America’s greatest electrical engineer. Much of his early work pioneered modern electrical engineering and many of his discoveries were of groundbreaking importance. In 1947, the United States Supreme Court credited him as being the inventor of the radio. Never putting much focus on his finances, Tesla died impoverished and forgotten at the age of 86. Tesla’s legacy can be seen across modern civilization wherever electricity is used. Aside from his work on electromagnetism and engineering, Tesla is said to have contributed in varying degrees to the fields of robotics, ballistics, computer science, nuclear physics, and theoretical physics. In his later years, Tesla was regarded as a mad scientist and became noted for making bizarre claims about possible scientific developments. Many of his achievements have been used, with some controversy, to support various pseudosciences, UFO theories, and New Age occultism. Many contemporary admirers of Tesla have deemed him the man who invented the twentieth century.